With US GDP in Q1 already tracking at a barely positive 0.4% according to the Atlanta Fed and expected to barely hit 2.0% for the full year (according to the double-dovish Federal Reserve), it wouldn't take much to push the US economy into a contraction in the current quarter (in which stocks have staged their biggest 3 month move since 1987), and perhaps in the second one, ending the second longest expansion of all time with a recessionary whimper. Just such a recessionary catalyst may be the fiasco involving the Boeing 737 MAX, which according to JPM economist Michael Feroli, could begin impacting the economic dataflow. According to the biggest US bank, the issues affecting the 737 MAX should have no short-run impact on GDP, as production of this airplane is continuing, but will affect the composition of GDP, implying more growth in inventories and less growth of business investment and gross exports. However, if the issues are not resolved in a timely manner and production of the 737 MAX needs to be halted for an extended period of time, it would take about 0.15% off the level of GDP, or about 0.6%-point off the quarterly annualized growth rate of GDP in the quarter in which production is stopped. Some context: the value of total shipments of aircraft by domestic producers in the US totaled $129 billion in 2016. 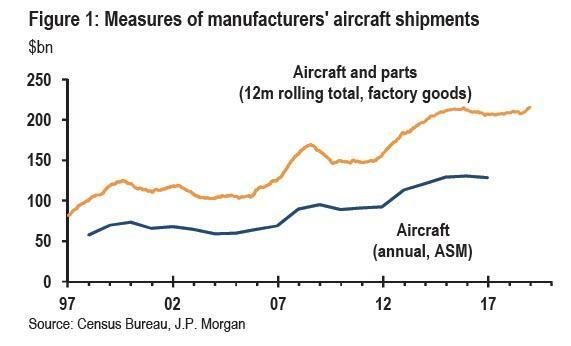 Extrapolating that figure using monthly shipments data by the aircraft and parts industry implies a similar figure for 2018, around $130 billion. The NIPA-based data arrive at a similar number and indicate that by category of demand, around 55% of that production is destined for export, 35% is purchased by domestic businesses, and 10% by the Department of Defense. Of this total in 2019, sales of the 737 were projected to total about $35 billion, with about 90% accounted for by the MAX model, or about one-quarter of total domestic aircraft production according to JPM's equity analysts. This value of shipments figure includes parts suppliers, not just the value added by Boeing, and so should be a reasonably accurate approximation of the GDP impact of the 737 MAX for this year: about 0.15%. For now, Boeing is continuing to produce the plane, with most, if not all of the final product, being put into inventory pending the completion of the investigation. In principle, this means that GDP should be largely unaffected for now, as weaker exports and business investment would be offset by more stockbuilding. On the other hand, should the 737 MAX orderbook collapse if passengers and potential clients back away as a result of the plane's devastated reputation, and Boeing be forced to delay or suspend production indefinitely, these will be foregone dollars that will directly hit US GDP. So how to keep track of what impact the 737 MAX has on the aggregate economy? According to JPM, there are a number of government statistics that will allow us to track how the 737 MAX issues are affecting the economy. 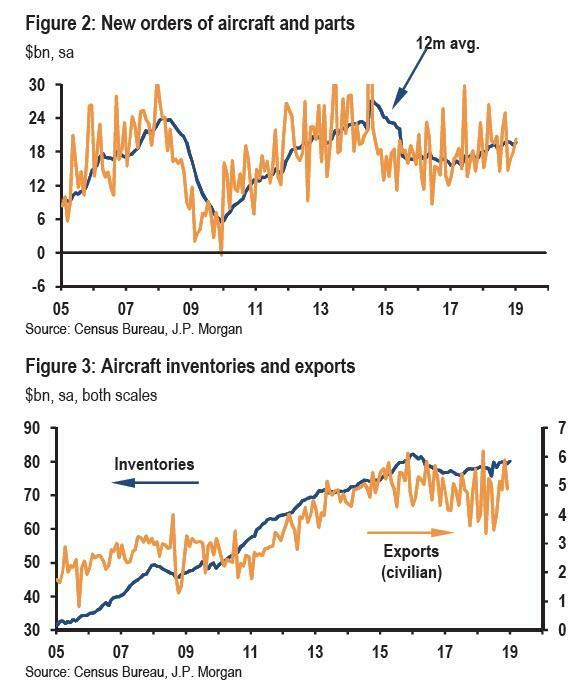 The Census Bureau’s factory goods report contains data on aircraft shipments (Figure1) and orders (Figure 2) as well as related inventories (Figure 3); these figures are also reported about a week ahead of the factory goods report in the advance durable goods data. In the Census Bureau’s data, ordersare reported net of cancellations; so, any cancellations will count as “negative” orders in the month in which they occur. Separately, the Census Bureau’s monthly trade reports contain data on civilian aircraft exports (Figure 3). Away from official government statistics, Boeing publicly reports a variety of statistics about its orders and shipments of aircraft. Of course, with the media acutely focused on every single development in the scandal, it is likely that any flood of order cancellations will be publicized long before it hits the US ledger.